DSP core designer CEVA has invested in an Israeli gesture recognition company. The software from eyeSight Mobile Technologies will run on CEVA's MM3000 ISP and video platform to add gesture recognition applications for mobile, digital home and automotive markets with the potential to improve power efficiency by a factor of 20. Renesas Electronics Europe has teamed up with industrial communication systems company Hilscher to develop a customisable 40nm system-on-chip (SoC) based around a combination of the ARM Cortex-A9 and R4 processor cores. An audio power cable costing over £20,000 has been described as "the most advanced cable technology ever developed." Aeroflex is launching two new 3GHz and 6GHz digital signal generators to fill out its S-series as well as two new vector signal generators ranging from 6GHz to 13GHz. Magma Design Automation has launched a design tool that extends CAD navigation and circuit debug from integrated circuits to stacked die, printed circuit boards and multichip modules. Freescale Semiconductor has developed a home health hub (HHH) reference platform to help medical equipment manufacturers quickly and easily create remote-access devices that can collect, connect and securely share health data for improved healthcare management. US chip designer Quantenna Communications has launched the first 4x4 gigabit-speed IEEE 802.11ac wireless local-area networking (WLAN) chipset. VIA Technologies has launched its latest Em-ITX form factor board, the VIA EITX-3002, which combines rich I/O with multimedia. Partnered with the new VIA AMOS-5002 industrial chassis kit, the VIA EITX-3002 provides a wide range of durable and fanless next generation devices in medical, healthcare, industrial and building automation, digital signage, kiosk, POI/POS, gaming and surveillance applications. The VIA EITX-3002 combines the VIA VX900H media system processor with the choice of a 1.2GHz VIA Nano X2 E-Series or 1.0GHz VIA Eden X2 dual core processor offering advanced multimedia capabilities for a wide range of costumer needs. When combined with the rugged VIA AMOS-5002 Industrial Chassis kit, absolute stability is provided within a wide temperature range in a low profile system less than 36mm high for fanless devices. "With the VIA EITX-3002 we're offering a full-featured board with industry leading power efficient dual core computing ideal for slim, fanless and rugged devices," said Epan Wu, Head of the VIA Embedded Platform Division at VIA. 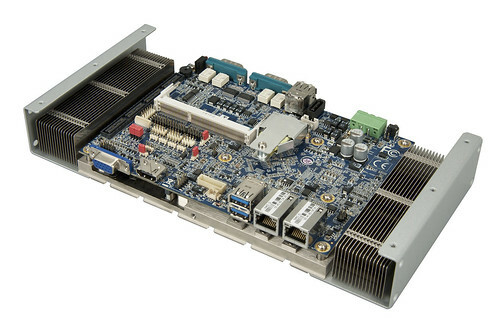 The VIA EITX-3002 is based on the unique 17cm x 12cm Em-ITX form factor, and is powered by a choice of a 1.2GHz VIA Nano X2 E-Series or 1.0GHz VIA Eden X2 dual core processor. The VIA EITX-3002 takes advantage of the VIA VX900H media system processor, a feature packed all-in-one digital media chipset that brings excellent hardware acceleration for the latest HD video formats including MPEG-2, H.264, VC-1, WMV9 and HDCP for Blu-ray content protection in stunning 1080p display. The VIA EITX-3002 supports dual independent display, allowing different content to be shown in different resolutions for superior digital signage displays. The design of the Em-ITX form factor places the VIA processor and VIA VX900H MSP on the reverse side of the board, optimizing the available real estate for a rich I/O configuration and facilitating slim fanless chassis designs. The VIA EITX-3002 includes an onboard DC-to-DC converter supporting both AT and ATX power modes, and power input voltages of DC 7V to DC 36V. An on board built-in 5-wire/4-wire USB Touch interface makes the EITX-3002 highly suited for high-end interactive touch screen multimedia applications. I/O support in dual I/O coastlines include an HDMI port, VGA port, two Gigabit Ethernet ports, dual COM ports supporting RS-232/422/485 jumper-less by BIOS setting, two USB ports, two USB 3.0 ports (optional), and power and HDD activity LEDs. Onboard connectors included 2 RS-232, four USB 2.0, 8-bit digital I/O, one parallel port, 24-bit LVDS interface, 5-wire resistive touch sensor interface and a thermal sensor by pin headers. The VIA EITX-3002 supports Windows 7, XP, Windows Embedded Standard 2009 and WES7 as well as Debian Linux 6.0 and Android 2.2 operating systems. The VIA AMOS-5002 modular industrial chassis kit is an ultra compact solution designed to take full advantage of the VIA EITX-3002 board, making it easy to create a broad spectrum of easy to assemble fanless system designs for a wide variety of embedded applications. Systems built using the VIA AMOS-5002 chassis kit are completely fanless and the innovative de-thermal design utilizing blade style thermal fins for the dual core processors can withstand a wide temperature range of -20°C to 55°C. Capable of sustaining a g-force of up to 50, the slim, rugged VIA AMOS-5002 chassis kits are easily assembled and maintained, using only four mechanical pieces to form a robust, fanless system with extensive I/O options.